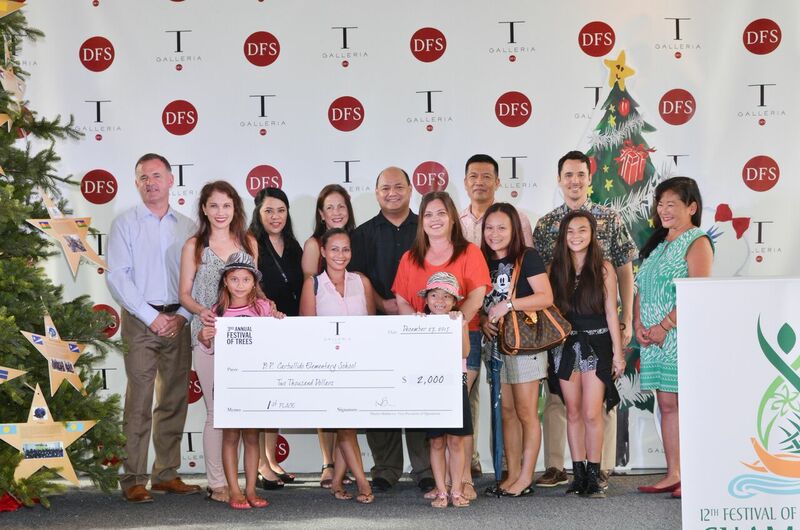 (Monday, December 28, 2015) – At the end of a fierce yet festive competition, T Galleria Guam by DFS awarded $10,000 in prizes to winners of the 3rd Annual T Galleria Guam by DFS Festival of Trees competition. In preparation for this year’s FestPac theme, 27 elementary schools took home rich knowledge of the 27 visiting nations to the 12th Festival of Pacific Arts (FestPac 2016) and cash prizes for their schools. The top six schools earned $500 to $2,000, and all other participating schools received $200. The FestPac Organizing Committee applauds the students for the quality of work that went into the research, design and presentation of each tree. The twenty-seven trees in the festival represented the 27 visiting nations at FestPac 2016, which will be held on Guam from May 22 to June 4. Elementary school students from 27 competing schools from around the island selected their visiting nations, conducted research on the countries’ arts and culture, and specially designed and hand crafted each set of ornaments. The 28th tree, the Guam tree, was designed by the DFS children. The FestPac Committee would like to recognize FestPac Latte Sponsor T Galleria Guam by DFS, the world&apos;s leading retail destination for international travelers and local residents, for utilizing one of its signature events to educate and excite residents about Guam’s important role in the festival and for introducing the festival to our visitors.